If you’d like to purchase the sheet music for this song, visit this link. 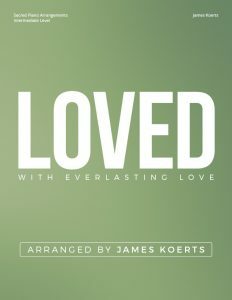 Here’s a brand new piano collection: Loved With Everlasting Love. 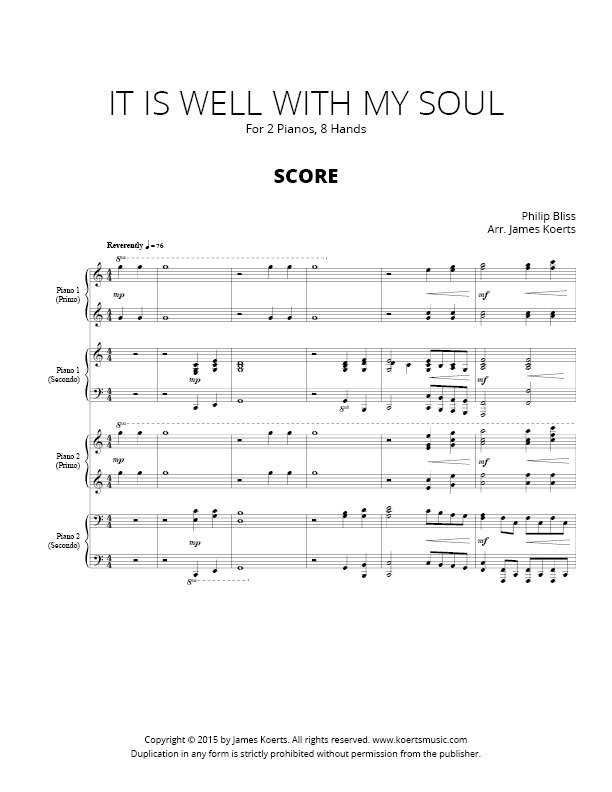 It includes 10 arrangements of well-known and beloved Christian hymns. Theses songs primarily fit in the intermediate level, with a few being late-intermediate, and probably just one that I would categorize as early-advance. In the few days that this has been released, I have already received so many positive comments from people who have picked it up and are enjoying playing the arrangements. I gotta tell ya, that’s what keeps me going: your kind and positive responses. Church pianists are among some of the kindest people out there! Something new with this collection that I will be gradually rolling out: YouTube videos of these piano arrangements. I hear from people all over who want to hear demos of the songs. So, my goal is to provide demos for each of the songs. This will provide prospective purchasers a chance to preview the sound of the sheet music, and it will give you a chance to listen to some (I hope!) great piano music in your spare time, if you are ever inclined to do so. View the preview pages here. Here is a new piano book published by The Wilds that you don’t want to miss! 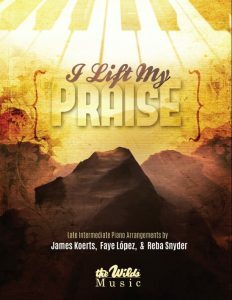 I Lift My Praise is a great resource for church musicians! Faye Lopez, a good friend of mine, and prolific arranger and composer, led our team of collaborators, Reba Snyder and myself, in the production of this collection. Mrs. Lopez also beautifully recorded the collection in an available companion album (see below). Titles Include: O Worship the King * Nearer, Still Nearer * Here Is Love * Take My Life, and Let It Be * I Run to Christ * A Passion for Thee * Complete in Thee * Nothing But the Blood * My Faith Still Clings * My Jesus, Fair * Make Me a Stranger * Brethren, We Have Met to Worship. You will particularly enjoy this collection of Late Intermediate piano solos because it also comes with a media disk that includes PowerPoint presentations for each song. This really is a great resource, and I’m thrilled to be part of it. Preview and listen to each song, and purchase the book with companion media disk here. Preview and purchase the companion album here. 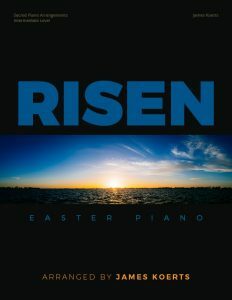 I’m very excited to announce the release of my newest Easter music endeavor: Risen, 12 Easter piano arrangements. What makes this collection different than last year’s Easter piano collection? The primary difference is the difficulty level. The Easter Collection is Late Intermediate/Early Advanced. This collection is set completely at an Intermediate Level, which will be helpful for many. Some of the songs are duplicates, but arranged in an easier style. Advanced pianists probably won’t find anything here (unless you’re looking for arranging ideas). Intermediate pianists and students will definitely enjoy this collection. Some might find these arrangements perfect for those circumstances when you might have little time to prepare, but you want some (hopefully) great sounding music. (It was hard writing that sentence without coming off arrogant. I hope you understand what I mean.) Teachers may find these arrangements to be great supplemental material for their studios. Over the first week of January I had the privilege of attending the Wilds Music Conference at the Wilds Christian Conference Center in Brevard, NC. I was given the opportunity to speak at a few of the workshops, which was a lot of fun. I met a lot of great people who lead in their various music ministries across the country. It was great to connect, meet new friends, and renew old acquaintances. The topics I spoke on were about church administration. My first session was a “nuts and bolts” session, which basically went through everything we do as ministers of music. My second session was more of a philosophical discussion that tackled two main areas: turning from a performance mind-set to a worship mind-set, and the idea that we all lead out of our calling. My third and final session was a potpourri of tidbits I’ve learned and done through the years. Whenever I’ve attended these sessions, I’ve always felt like I could walk away with one or two nuggets that I could take back to my ministry and incorporate. And that was my goal for the participants in my sessions. From the feedback I heard, people seemed to appreciate the content. Publisher’s Description: Like a Celtic folk dance, this contemporary composition lilts from the page and into the heart. Immediately engaging, this melody connects with the words, beautifully presenting a praise-worthy testament of worship. Accessible vocal writing sounds great with smaller ensembles, while bigger groups will enjoy performing this festive number with the optional Celtic consort orchestration. Score and Parts (ac gtr, mndln, b, dm, pnywhst/fl, fdl/vn) available as a digital download. Purchase your copies here (offsite). 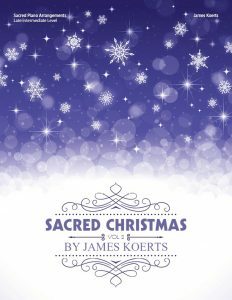 Introducing my newest self-published Christmas piano arrangement book, Sacred Christmas, Vol. 2. I’m really thrilled with how this project turned out. As the sequel to my first self-published Christmas collection (Sacred Christmas, Vol. 1), this collection really finishes out the Christmas repertoire with ten selections that are perfect for your holiday services. Preview pages here. Click here for more details. There’s a quote on the internet that I thought was great, and it is relevant to music ministry in addition to many other areas of life. The second fiddle. I can get plenty of first violinists, but to find someone who can play the second fiddle with enthusiasm–that’s a problem. And if we have no second fiddle, we have no harmony (Leonard Bernstein). This warm, contemporary ballad contrasts the life of a believer before and after experiencing the saving grace of Christ. Sensitive lyrics, a memorable melody, and inclusion of the well-known chorus of “Grace Greater Than Our Sin” will make this selection an instant favorite with choirs and congregations alike. Listen to the demo here. Here’s the concept: have instrumental solo music that is tailored for specific instruments. Basically, I write an arrangement for a solo instrument with piano accompaniment, and then I go back and customize the arrangement for each instrument in these three instrument sections: strings, woodwinds, and brass. So you will have the same arrangement be available for violin, viola, cello, flute, oboe, clarinet, saxophone, French horn, trumpet and trombone. Learn more about this imprint here. We’ll be adding new titles in the coming months, so be sure to check back. Here’s an arrangement of “The First Noel” with a Celtic flair! Let the choir enjoy singing this rousing Christmas anthem with new and familiar melodies. In addition to a spirited piano accompaniment, the optional violin and hand drum parts are included. When it comes to the volunteer church choir, I’ve come to the conclusion that a “great choir” is a choir that worships God passionately with excellence. It’s a choir that understands its role as a collective worship leader, leading the way to the very throne room of God. And I’m always interested in what will make the choir (or any music ministry team) be a place or ministry that people want to be a part of; where they are humbled and honored to be involved. The truth is, I want that for myself. I’ve read this great article about how to build a great choir by Mike Harland here. You should give it a read! I was recently interviewed about church music ministry by my friend, Mark Martin, who is also involved in church music ministry. For both of us, it was our first attempt doing this sort of thing with Skype, but we had fun talking about things that music directors like to discuss. My approach to a music ministry kickoff. What got me started arranging piano music. What are some keys to having a growing committed orchestra ministry. Ideas for writing for an orchestra. A notation software feature that will help you if you don’t know an instrument’s range. Whether you need to be a theory geek to be able to write music. How long it takes me to write a piano arrangement. So head on over to Mark’s site and watch this 35 minute video. Also, you should know, Mark has recently begun selling sheet music on his website, and he also has a free piano arrangement that you’ll want to get! His arrangement of “My Jesus, I Love Thee” is worth checking out, too. 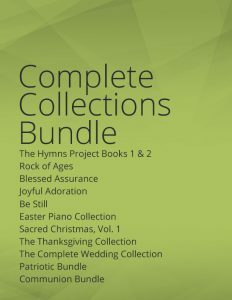 This bundle includes six piano collections: The Hymns Project (Books 1 & 2), Rock of Ages, Blessed Assurance, Joyful Adoration, and Be Still. In all, you get 61 complete piano arrangements, ranging in difficulty from early intermediate to early advanced. If you purchased each individual collection, you would spend $90. At $75, you save over 15% with this bundle. Important note: All music included in this bundle is served as digital downloads (PDF). Go to the Sacred Collections Bundle page. 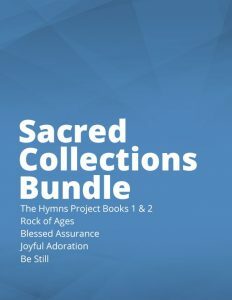 This bundle includes nine sacred piano collections, the Complete Wedding Collection, and two bundles (patriotic and communion) with multiple arrangements. In all, you get 126 piano arrangements at various difficulty levels. If you purchased each individual item in this bundle, you would spend nearly $200. At $160, you save nearly 20% on most sheet music offered at the Koerts Music sheet music store! Go to the Complete Collections Bundle page. Inspired by a music conference I recently attended (in which several people asked about piano ensemble music), this new piano arrangement is for four pianists (8 hands) at two pianos. You can preview many of the pages here. Interested in recording this? Leave a comment below with a link to your YouTube video! Let us hear how it sounds. For a limited time (offer ends August 1st), you can get a free sacred piano collection when you purchase two collections. Simply choose three sacred piano collections and put them in your cart. The discount will be applied automatically (no discount code is needed). Applies to digital downloads only; bundles do not apply. Visit the store today to enjoy your savings! 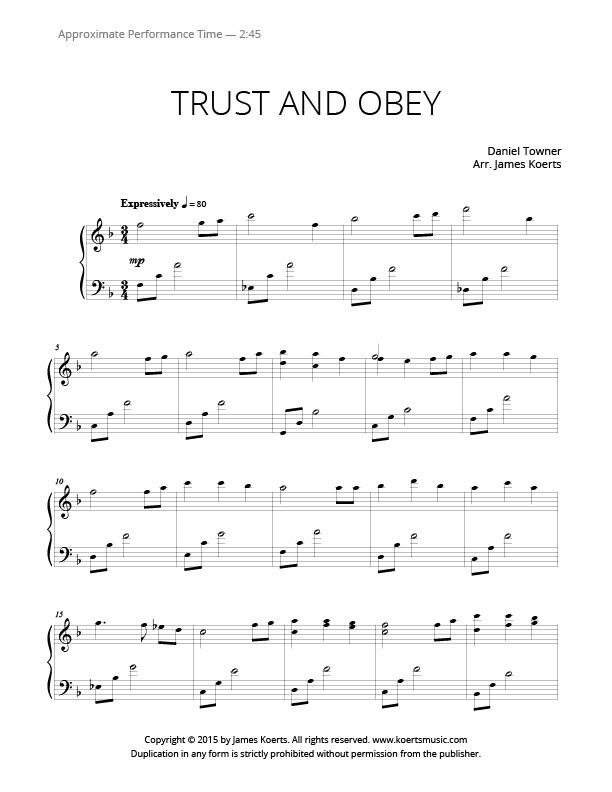 Here’s a mostly simple arrangement of the favorite gospel song, Trust and Obey. You know when I think of this song, I think of its simplicity. As Christians, we need to simply trust and obey God. However, it’s not always as easy as it sounds. That’s why we need the reminder. I hope you enjoy this song. It won’t take long to learn it, and I hope it will be a blessing to your worship service. As many of you know, at the end of last month I released the digital version of my new album (as well as the digital sheet music), “The Hymns Project,” and then I promptly went “off the grid.” Except for the website support (which I handle all of), and a few Facebook interactions, I laid low. The primary reason was because our family took a vacation for the first two weeks in June, and upon returning, I mainly spent the rest of June focusing on my church ministry responsibilities. 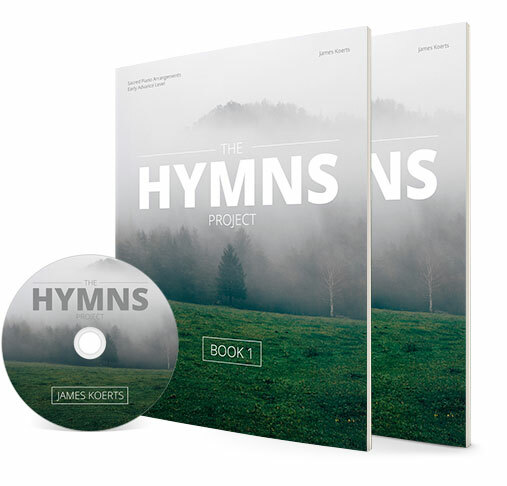 I’m very excited to share with you my newest work: The Hymns Project. Inspired by the hymns I sang and loved as a child in the small church that I grew up in, this project represents my second full length recording project. These reflective arrangements are presented with a gentle touch and a joyous spirit. Visit this link (or click the link at the bottom) to learn more. This project represents many hours of work, and it’s such a great feeling of accomplishment. It’s my goal to be an encouragement to you, and to help you be an encouragement to others. Thanks for reading, and thanks for your continued support of my ministry. 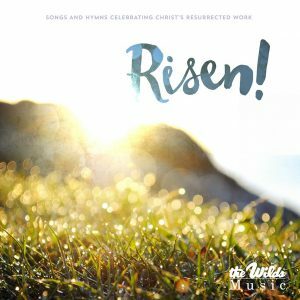 Here’s an album with some great new music which celebrates the risen Savior. I’ve been privileged to write and arrange music for the music publishing arm of the Wilds Christian Camp in Brevard, NC. This album contains three of my arrangements, and three corresponding orchestrations. As a budding orchestrator (am I allowed to call myself that? ), I relish in the opportunities to orchestrate arrangements. It really is a great experience. I hope you’ll check out this album, and consider adding it to your music library.